Mayoral candidate Steve Hagerty at his campaign kick-off event Tuesday night. Hagerty is joined in the race by three other candidates. Evanston is on the right track, but it needs a leader who can keep it that way while making small but necessary improvements, said business owner and mayoral candidate Steve Hagerty at his campaign kickoff event held at the Hilton Garden Inn Tuesday night. Hagerty informed The Daily of his candidacy on Sept. 19 but officially started his campaign at Tuesday’s event. Hagerty is founder and CEO of Hagerty Consulting, which focuses on assisting those who have suffered from emergencies, such as 9/11 and Hurricane Katrina, by working with the federal government to strategize and find solutions to large-scale problems created by catastrophes. Hagerty Consulting has operated in Evanston for about 15 years and has collaborated with Northwestern to develop emergency plans. The job of providing emergency relief to those in need has been very rewarding, and the chance to serve as Evanston’s mayor presents new opportunities, Hagerty said. “It’s been wonderful to help people on the worst day of their life, but I’d like to help people have a great day every day of their life,” Hagerty said. Hagerty said his experience consulting for governments at various levels will serve him well as Evanston’s mayor. During his speech, Hagerty emphasized his loyalty to Evanston, praising residents’ hard work at improving their community. He added that Evanston doesn’t need major reforms, but it does need strong and steady leadership. Former mayors Jay Lytle and Lorraine H. Morton were present at the kickoff event. Morton was quick to affirm her support for Hagerty and praised his dedication to Evanston’s economy, community and civic programs. 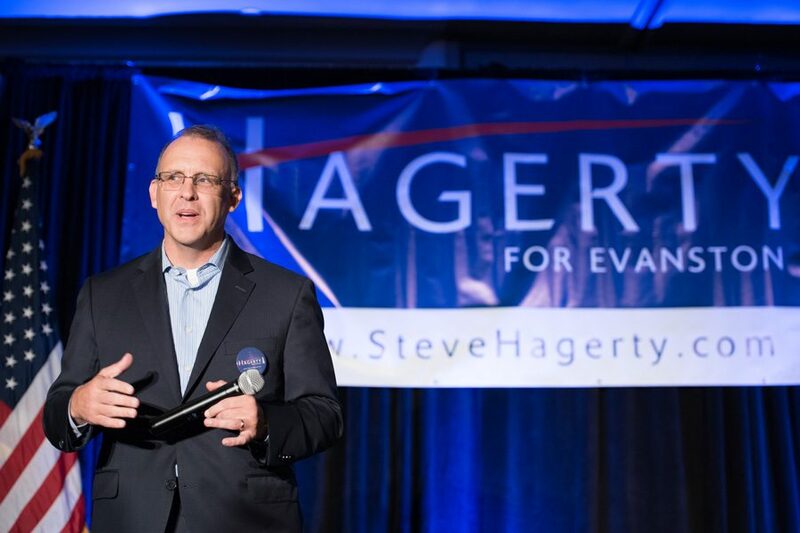 Although much of the crowd included Hagerty’s business partners and Evanston leaders, many residents showed up to witness the candidate’s campaign officially begin. Hagerty is joined in the race by Ald. Mark Tendam (6th) and Ald. Brian Miller (9th), as well as former Evanston Township Supervisor Gary Gaspard. The election is April 4.